A few weeks ago, I found myself staring at a handful of peaches that were quickly spawning spots of mold on their surfaces. Of course, being the frugal cook that I am, I immediately intervened. With the precision of a pastry chef, I carefully sliced off areas with signs of mold and washed the peaches in cold water. I admit that trying to save the rotting peaches was a risky behavior, but the attempt was well worth it. Compared to apples, peaches contain less calories and about the same amount of fiber per fruit. Where peaches triumph are in the vitamin A department. Like most fruits, peaches are high in sugars, but they will keep you more satisfied than unnatural forms of sugar. Personally, I think peaches taste better when they are room temperature. Anyways, peach juice is as simple as coring the peaches and blending them with a tinge of lemon juice. I simply halved all the peaches in order to twist the peach seed out. The viscosity and texture of the peach juice all depends on how long the peaches are run in a blender. 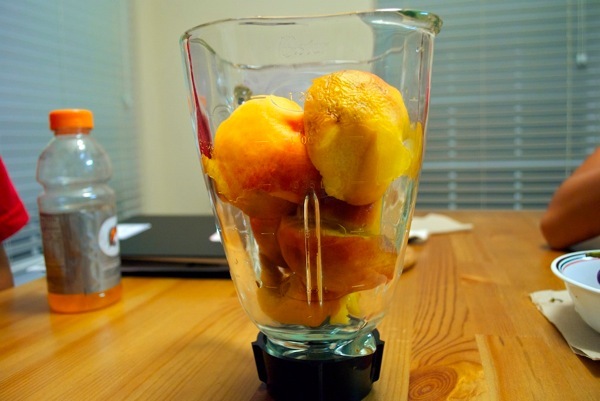 I’m not a fan of chunky juices, so I blended my peaches for a long time. Also, I thought of straining the blended peaches with a cloth, to further clarify the juice, but decided not to, saving some nutritious fibers and texture. Peel peaches (optional), slice in half, and take out the seed. 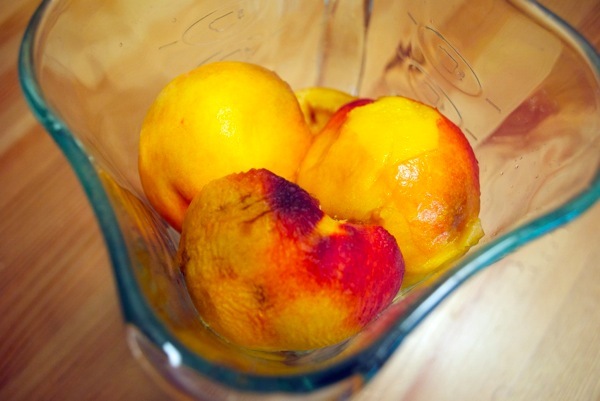 Throw halved peaches into blender with about 3 tablespoons of lemon juice. Blend until juice reaches desired consistency.